Modeled after the venue's 1920 origins, Speakeasy is a clandestine space that accommodates up to 75 guests and is the perfect hideaway for an intimate, private gathering. Masked under the guise of a fireplace, the hidden entrance door reveals walls covered in velvet, plush couches, a Cherry wood bar, and an antique slot machine. Three plasma screens decorate the walls and the ceiling is brought to life my an LED star maze. With its own bar, bathrooms, and separate entrance, this space is much sought after for celebrity and corporate gatherings that wish to "fly under the radar". $5,000 minimum for this space. Entering from the famous Sunset Boulevard, guests pass through a large wood and iron gate into a landscaped English courtyard. In the center of the garden sit a pair of reflecting pools, one ending in a 20 foot tall fireplace whose flames seem to float on the water. Bordering the courtyard are private cabanas surrounded by Crape Myrtle trees, separated by a Ficus wall with an open window “floating” in the middle. The full service Garden Bar resides unobtrusively amid fragrant gardenia plants providing ease of access to our trademark homemade, organic cocktails. Enhanced with LED lighting and gobo projection opportunities, the garden can be customized to organically reflect a corporate brand or party theme. Capacity - Standing Reception: 275 - Wedding Ceremony: 90 Seated - Seated Luncheon: 120 Space rental fee for this area is $5,000 (not including bar and staffing fees). The three story, 8,000 square foot Grand Ballroom is without a doubt the most spectacular room in all of Los Angeles. An expansive dance floor intricately designed of stone, steel, and wood is hovered over by thirty foot high ceilings and a majestic skylight. 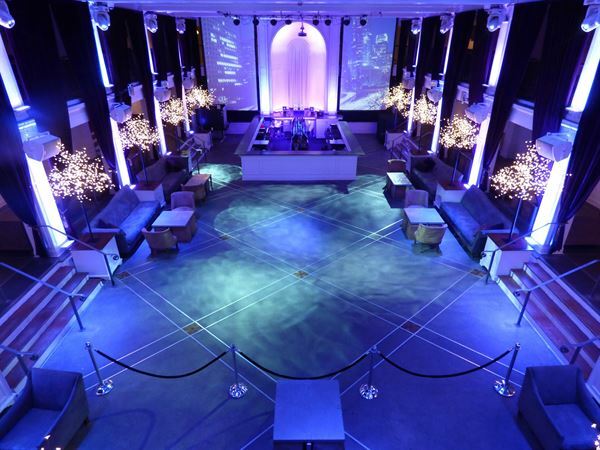 The ballroom features a spacious main bar that is eclipsed by a custom stage that can be transformed into a platform for a speaker, press conference, fashion show, or dynamic live performance. Boasting a half a million dollar Color Kinetics LED lighting system and a top of the line Tannoy sound system, BOULEVARD3 provides the highest level of entertainment. Around the periphery of the ballroom, a Mezzanine is set just three feet above the main floor providing a perfect locale to experience dance floor festivities. The highest level of Boulevard3 is the Balcony, an exclusive area overlooking the entire ballroom. Recessed to offer privacy from eyes below, balcony guests have access to their own upstairs bar and fifteen unique seating areas each fitted with its own plasma screen. The balcony provides unobstructed views of the dynamic performances that may occur throughout the evening. Ranging from innovative cirque performances to full choreographed shows, Boulevard3 produces a wide array of entertainment and delivers an unforgettable experience. $10,000 Space Rental Fee includes: - Use of the LED Architectural lighting System - Elation 250 Spotlight System - Tannoy Sound System - Cutting edge DJ Equipment - Two large 16' by 9' projection screens - 13 plasma screens - LED LOGO wall - Library 5' by 8' projector - Video content control system that will display static images, moving images, slideshows or background visuals - Wireless microphone Capacity - Standing: 650 - Seated Dinner: 360 Loading through both front doors and rear access. Ramps and Hydraulic Lifts available for use.